As pet owners, we have many important responsibilities that we must accept when we welcome a pet into our homes. Shelter, food, love, and health are the most important things that we need to offer our pets, and most of those things go hand in hand. Our rats can’t really tell us what they feel like eating using their words, but when it’s time for a treat they’ll always come running, so that’s a pretty good indicator! But it’s not always time for treats. 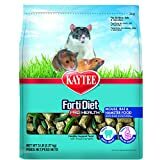 When it’s dinner time, and your rat needs a good hearty meal to keep them healthy and to give them the energy to do all sorts of fun rat things, here are the best brands of pet rat food to keep their little motors running! Note: Just like people, rats can have food preferences, too. It’s not a bad idea to try out a few different bags of food to see which one they like the best, it’s kind of fun to see if you can tell which they like by observing them, or just putting both types in their bowl and seeing which one lasts longer. Oxbow Regal Rat is one of the most popular commercial rat foods available and for good reason – it is nutritionally balanced and avoids “fillers” like seeds and corn that most rats would happily choose over kibble. Each piece has the same amount of each ingredient in it, as opposed to certain mixes where it looks more like a trail mix for rats, which is good because it means your rat is getting all of their nutrients, instead of picking and choosing their favorite parts of the meal. It’s formulated for adult rats, so you can be sure that your rat pal is getting correct balance of protein, fat, and carbohydrates to suit their needs. It contains no artificial flavors, preservatives, or GMOs. The reformulated flavor. In 2011, the company decided to take complaints received from customers seriously and made the product more appealing and flavorful, while still steering away from artificial flavors. Having a nutritionally balanced diet. We feel our best when our diet is well-balanced, and the same goes for our rat friends too! An Envigo (Formerly Harlan) Teklad Laboratory Diet. Nutritionally balanced and exceptionally consistent. Repackaged by Nesom Distributing for your companion animals. Globally recognized as one of the best quality rodent diets available. Originally known as Harlan Teklad, this food has been highly regarded in the rat community for years because it doesn’t contain fish meal, meat by-products, alfalfa meal, or soybean meal. It’s available in different formulations depending on the age of your rat, but we’re looking at their lower protein option (2014) which is appropriate for most adult rats. If you have a younger rat, you’ll want to find a suitable food for them to ensure they’re getting what they need for their little growing bodies. If you’re worried about the nutritional quality of fish meal, meat by-products, and soybean meal, this is one of the only commercial rat foods available that doesn’t contain any of them. The reasonable price tag – You can get 5 pounds for only $15.99 USD. The high-quality ingredients. Just like humans, nutrition is important for living a long, healthy life. While we aren’t about to do a taste test, rats seem to really love the flavor with many owners reporting how much their rats love it! This nutritionally-sound food is another popular option among rat owners. It is naturally formulated with Vitamin E and contains flaxseed – a great source of omega-3 fatty acids. It contains all the nutrition your rat needs to thrive and live a happy, fulfilling life with you. Like the first two options, this food is made into pellets so it’s easy to feed your rats and you won’t have to worry about unnecessary waste. It contains yucca schidigera, an extract that is completely safe for rodents and helps reduce the smell of ammonia. The high-quality ingredients and freshness of the product. Your rats will really enjoy eating these flavorful, healthy pellets! This affordable option is readily available at most pet stores, making it a feasible option for many rat owners. It contains both probiotics and prebiotics to encourage optimal digestive health and it is rich in natural antioxidants, a great contributor to overall health. We would like to mention that this food contains citric acid, so you should steer away if you have male rats as citrus is dangerous for them. Female rats are unaffected by citrus and will be just fine eating this food. The low price and accessibility – for a low price, you get 5 lbs of high-quality food, and you can find it at most major pet stores. The addition of probiotics and prebiotics – this is a unique feature not found in most types of rat food! The added crunchy bits – they are perfect for keeping your rat’s teeth trim and ensuring dental health. The attention to preserving digestive health – this will keep your rat healthy and feeling good inside and out. How do I know if the food I’m choosing is right for my rat? The type of food you buy will depend on the age of your rat. As young rats are still growing, their protein and fat requirements are higher than those of adult rats. Similarly, your female rat’s nutritional needs will also differ if they are pregnant or nursing young pups. Most adult rats should be fed a diet that is between 12-20% crude protein, 75-80% carbohydrates, and 4-6% fat whereas young rats and nursing females need between 18-25% crude protein and 5% fat. Do I need to supplement my rat’s diet with vegetables, fruit, or anything else? It’s a great idea to supplement your rat’s diet with fresh vegetables, fruit, and meat if their main food doesn’t contain any. Although many commercial rat foods are nutritionally-sound, fresh fruit and vegetables contain important vitamins and minerals while adding necessary variety to their diet. Popular choices of fruit and vegetables for rats are bananas, apples, grapes, broccoli, peas, and carrots. If you need to supplement their diet with meat or alternative, many rats enjoy lean cuts of meat like liver and cooked beans. How much dry food should I give my pet rat? Most adult rats will eat between 12 and 20 grams of dry rat food per day. If you are supplementing their diet with plenty of fresh vegetables and fruit, this amount should be reduced. If you happen to notice your rat hoarding food, this a good sign that you are feeding them too many pellets and you should cut down on the amount of dry food you give them. With the above four options featuring the best rat food brands, you’ll be able to find something that suits your budget, and your rat’s dietary needs! Remember, they can’t speak to you to tell you which foods they like best, but you can observe them and pay attention to their behavior and get a pretty good idea. If you’re ordering online, we always recommend to keep tabs on how much food you have left, and even try to keep an extra bag on hand. This is where it really pays to grab more than one brand initially, you get to try out different foods for your rat, and whichever one they don’t like as much can be kept on-hand as an emergency stash.